Maipe was the lord of the winds to the ancient Andean people. The wines are produced by Bodegas Chakana in the Luján de Cuyo subregion of Mendoza. Juan Pelizzatti founded Chakana on May 2, 2002 the day The Souther Cross (Chakana in Mapuche) reaches a perfectly vertical position, marking the beginning of a new farming cycle. Their vineyards are are both in Agrelo, Luján de Cuyo, in the foothills of the Andes Mountains at an altitude of 3,000 feet above sea level. 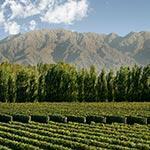 Agrelo is a cool climate region in Argentina's premier grape growing area. Their three fincas are home to some very special plots of 100+ year old Malbec vines. Currently the estate is in the process of a Biodynamic viticulture conversion and certification. Winemakers Gabriel Bloise, Liliana Iannizzotto and consultant Alberto Antonini are crafting wines that are an expression of old vines, deep rich soils and a commitment to excellence. "This Malbec has a deep purple color with violet tints, complex plum, fig, strawberry, spices and floral aromas; rounded and velvety tannins, excellent length with a distinguished character." Wine Advocate 87"The juicy and fruit-driven 2017 Maipe Malbec Reserve is produced with a selection of grapes from Agrelo and aged in French oak barrels for 12 months. The oak is barely noticeable and comes through as a soft, easy-to-drink Malbec." Wine Advocate 87Excellent Wine Values for Under $25"The 2015 Maipe Malbec is another 100% Malbec, with a deep purple color and a style similar to the Lexicon, with chocolaty, blackcurrant and blackberry fruit, as well as touches of licorice and earth. It is delicious, soft and round." James Suckling 92"A red with lots of dried fruit and spices follows through to a medium to full body, silky tannins and a fresh finish. Drink now."